After 2 lengthy sessions Mr.Maxwell G.Lee was elected Hon.Gen.Sec. of IVU and Mr Amarjeet Singh Bhamra as Hon.Asst.Gen.Sec. right: Maxwell Lee who will be taking over as Secretary of the IVU on the retirement of Brian Gunn-King. Maxwell is a very active member of the VSUK having been the Chairman of the Publications Sub-committee for 8 years, and a Council Member for most of that time. He often organises speakers' courses and naturally takes a great interest in the magazine! He is a senior lecturer in Geography & Environmental Studies at Manchester Polytech. Photo: VSUK staff. . . .present:- . . . Mr Maxwell G. Lee (Hon.General Secretary), . . .
Minutes of a meeting of the International Council of I.V.U. held at the Movenpick Hotel, Edwin-Scharff-Haus, Silcherstrasse 40, Neu-Ulm, West Germany, on Satturday 11th and Sunday,12th July, 1981. Mr.Maxwell Lee is investigating the possibility of obtaining discount rates on party travel from the UK to Ulm. If you are interested please send an SAE to him as soon as possible: 10 Kings Drive, Marple, Stockport, Cheshire, SK6 6NQ, on the understanding that there is unlikely to be any reply from the Airlines before march. However, Mr.Lee needs to hear from you at an early stage in order to estimate the demand. right: At the Conference table, left, Ulrich Schröter - Deputy President, centre, Gordon Latto - President, right, Maxwell Lee Hon.General Secretary. The Mankar Memorial Award can be seen in the foreground.
. . . Mr Maxwell Lee, were re-elected to their respective offices. The Hon.General Secretary reported that his main aim since his election at the last World Congress had been to consolidate the affairs of I.V.U., to develop contacts with vegetarian societies throughout the world, to revise the constitution, to maintain regular communication with member societies and to discover the needs and wishes of members. He has publishes an annual newsletter which had been well received and had produced a leaflet about I.V.U. which was available at the Congress. He would now like to see I.V.U. play a more active part in world affairs. In particular, it would be desirable for I.V.U. to seek representation on appropriate United Nations and regional advisory bodies. He invited societies to let him have details of suitably qualified persons who might represent I.V.U. Minutes of the continued meeting of the International Council (23/7/82) held on Saturday, 27th July, 1982. Minutes of a meeting of the International Council of I.V.U. held at the Edwin Scharff-Haus, Neu-Ulm, West Germany on the 26th July, 1982. Present: . . .Mr. Maxwell Lee (Hon. General Secretary). The importance of communication was stressed and the need for all to keep in contact with each other ad I.V.U. to ensure the co-ordination of vegetarian activity in the world. Various approaches to vegetarianism were mentioned and some of the resultant problems. A discussion ensued on catering at World Congresses and whether or not both vegetarian and vegan meals should be provided. It was proposed by Mr.S.Mehta that lacto-vegetarian food should be made available at all future World Congresses and that host countries should decide on the diet in consultation with the Hon.General Secretary of I.V.U. This was agreed by a large majority. Minutes of a meeting of the International Council of I.V.U. held at the University of Maryland, Catonsville, U.S.A. on the 31st July, 1984. Present: . . . Mr Maxwell Lee (Hon.General Secretary). The International Vegetarian Union held its first European Conference last August in Cervia, Italy. . . .In a meeting held in Brussels in December, Maxwell Lee, Chairman of Council of the VSUK, was elected President of the European Regional Council of the IVU. MINUTES OF A MEETING OF THE INTERNATIONAL COUNCIL OF I.V.U. 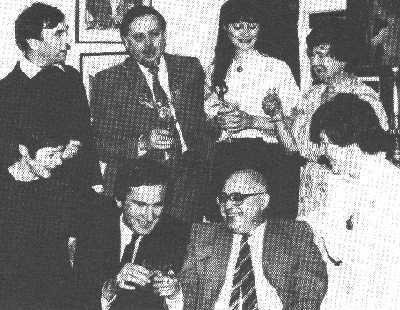 HELD AT THE INDIAN CULTURAL CENTRE, BRUSSELS, BELGIUM ON 15th FEBRUARY, 1986.
. . . Mr.Maxwell Lee and his wife were also present at the welcome supper party and discussed with Mr Maglaic a possible Congress to be held in Yugoslavia in a few year's time. Mr Maglaic enjoyed a guided tour of Parkdale the following day courtesy of Mr Lee and particularly enjoyed seeing the library and the many vegetarian books from the last century. . . The Hon.General Secretary, Mr.M.G.Lee, stated that he was encouraged by the increasing interest in vegetarianism and the growth of activity in various parts of the world. He mentioned the development of a regional organisation in Australasia and its activity as well as the increased number of member societies and individuals in the United States. He particularly stressed the massive growth of vegetarianism in the United Kingdom and the development of the European Vegetarian Union which aimed to organise regional congresses and encourage the development of more vegetarian societies in Europe. 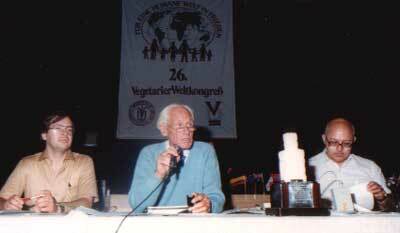 Minutes of meetings of the International Council of the International Vegetarian Union held at the Hotel Fiesta Americana, Guadalajara, Mexico on 1st and 2nd August, 1987. PRESENT: . . .Maxwell Lee . . .
1988 - World Vegetarian Congress in Mexico cancelled. Minutes of a Meeting of members of the International Council and represetatives of the Israeli Vegetarian Society at the Kfar Maccabiah Hotel, Ramat Gan, Israel on 1st April, 1989. 1. Election of Chairman : Mr M. Lee was elected as chairman. PRESENT . . .Maxwell Lee. . . The Hon.General Secretary spoke of the exciting developments taking place in Eastern Europe now that it is possible to organise vegetarian societies. He welcomed the few participants who had managed to come to the congress from Eastern Europe and hoped the numbers would be greatly increased in the future. He spoke of the increasing interest in a vegetarian way of life with many people now turning to a more healthy diet and due to increasing concern about the treatment of animals and the effects of a meat-based diet on the Developing World and the environment. The scope for congresses was increasing considerably. members were reminded of the importance of communication and he asked all to write regularly to him so that he could include information from various parts of the world in the Newsletter. he reminded everyone of the need to pay their subscriptions to IVU to enable the work to continue and develop. Minutes of meetings of the International Council of I.V.U. held during the World Vegetarian Congress at the Kfar Maccabiah Centre, Ramat Gan, Tel Aviv, Israel from 17th - 24th April,1990. Minutes of meetings of the International Council of I.V.U. 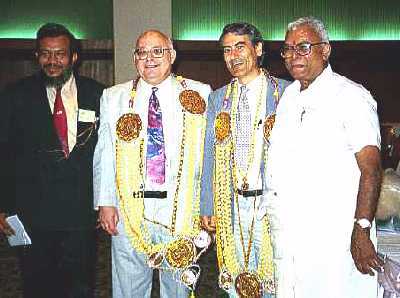 held during the World Vegetarian Congress in Madras, India from 5th - 10th January, 1993. Present . . . M. G. Lee (Hon.General Secretary). The development of vegetarian movements in Eastern Europe was described and the presence of so many delegates from Eastern Europe welcomed. He mentioned that he had made several lecture tours visiting Thailand, Australia, New Zealand, Spain, Poland and Lithuania since the last world congress. He had also represented IVU with the Deputy President and several others at a conference on vegetarian nutrition in Washington, DC. The President and Hon.General Secretary had met with Indian diamond merchants in Antwerp and this had led to sizeable donations to help IVU expand its work. Their support was most welcome. IVU continued to help newly developing vegetarian societies in various parts of the world. Requests for information to IVU continued to grow and the Vegetarian Society of the United Kingdom continued to help IVU by providing and sending out suitable material. The amount of correspondence was increasing and fax communication was an important factor in this. The new computer was proving a great asset due to its versatility and this meant the Hon.General Secretary was able to produce the newsletter on it as well as headed note paper. The workload of the Hon.General Secretary meant that it was desireable for IVU to look towards having a full-time person in the post as soon as possible. The meeting was reminded that the Hon.General Secretary had indicated to the International Council that he wished to retire from the office in 1996 and emphasised the need to arrange a suitable replacement. IVU's greatest need was fuel for the future. The fuel referred to is money. Unless the assets greatly increase the possibility of growth in IVU's activities would continue to be very much constrained. Minutes of meetings of the International Council of I. V.U. held at various times during the World Vegetarian Congress in The Hague, The Netherlands, from 7th - 13th August, 1994. Minutes of a meeting of the International Council of I.V.U. 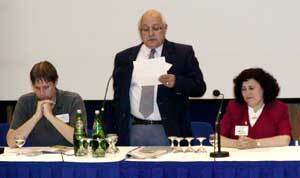 held on 25th July, 1995, at the Congress of the Furopean Vegetarian Union held in Bratislava, Slovak Republic. Minutes of a meeting of the international Council of I.V.U. held on 7th & 8th August 1995, during the Vegan Festival held at the San Diego State University, USA. IVU Newsletters 1995/96 Issues - edited by Maxwell, with secretary's reports etc. Mr Lee spoke about the role he had played for 17 years and the changes that had occurred to IVU during the period. He described the difficulties of trying to maintain one's own career whilst carrying out the duties of the Hon.General Secretary in spare time. There had been a growing amount of correspondence by mail fax and e-mail which demanded the General Secretary's attention. The role had also grown to encompass lecture tours to promote vegetarianism in various parts of the world, the need for the General Secretary to visit world congress venues and to negotiate future possibilities. IVU, as an international organisation needed to obtain recognition from the United Nations and other world and regional organisations so that it could put forward the vegetarian point of view at meetings concerning, food, health, morality and environmental matters. All these activities had financial implications. There is a growing demand for IVU support to newly developing vegetarian societies and, in recent years, IVU has played an important role in encouraging the developing vegetarian movements in Eastern Europe and Africa. The regional organisations of IVU are not strong and need much greater support in terms of finance and participation by vegetarians in the regions. In particular Latin America, the Middle East and Australasia and Asia are in great need for support to enable new societies and groups to be encouraged and helped to develop. Without growing financial support IVU would not be able to do these things. It was desirable for the post of Hon.General Secretary to be replaced by a full time paid General Secretary and for the regional organisations to be strengthened and provided with resources. The Hon.General Secretary thanked everyone for their support during his time in the post which had not always been easy and had put increasing demands on his time during the period. The President, Mr Surendra Mehta, thanked Mr Lee most sincerely for all his efforts over a long period and paid thanks to Sylvia Lee who had helped and supported her husband during his period of office. He mentioned how harmoniously he and Mr Lee had worked together. 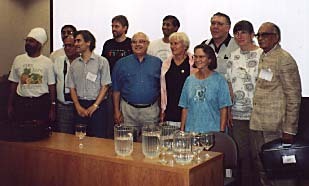 right: The Officers and some Council Members of the IVU, from left: Pornthep Srinarula (Thailand), Hiren Kara (India), Francisco Martin (Spain), Kevin Pickard (Canada), Maxwell Lee (UK), Saurabh Dalal (USA), Sigrid De Leo (Switzerland), Patricia Carney (USA), Howard Lyman (USA), Hildegund Schovien (Germany), Surenda Metha (India). There being only one candidate for the post of President, Mr.Howard Lyman, and one candidate for the post of Deputy President, Mr Maxwell Lee, the President, Mr Mehta, declared them both elected unopposed. Mr Maxwell Lee stated he looked forward to continuing to work for world vegetarianism, albeit in a different role. He felt there was much to do and wished his successor, Mr Francisco Martin, well in his task. 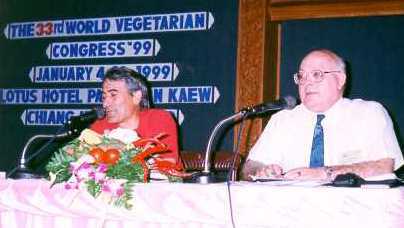 The President, Mr Mehta, stated he had known Mr Lee since 1979 and spoke of his role in both the British and international vegetarian movements. He felt Mr Lee was sincere and hard working and he had moved the vegetarian movement forward during his period of office as Hon.General Secretary. He felt that the combination of Howard Lyman and Maxwell Lee leading IVU would move international vegetarianism higher and higher. Minutes of a meeting of the International Council of 1.V.U. 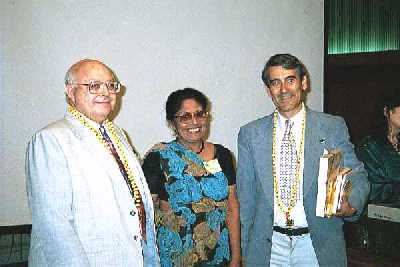 held at various times during the world vegetarian congress held at the University of Pittsburgh, Pitt-Johnstown Campus, Pennsylvania, USA. Present: . . .Mr Maxwell Lee. Mr Maxwell Lee and Mr Kevin Pickard contested for election. Mr Maxwell Lee was elected President by a large majority. A meeting of the International Council was held on Sunday, 3rd January, 1999 at 2 p.m. at the Lotus Pang Suan Kaew Hotel Chiang Mai, Thailand. Those present were : 1. Mr. Maxwell Lee, Deputy President, in the chair . . . The second session of the IVU Council was held on Friday 8/1/99 at 1.30 at the Lotus Pang Suan Kaew Hotel, Chiang Mai, Thailand. Those present were : Mr. Maxwell Lee. President in the chair. . . In the absence of the IVU Chair (Maxwell Lee), the Deputy Chair, Kevin Pickard, took the chair and welcomed the attendees. - this was the first meeting of the International Council which Maxwell missed since 1979. He had been unable to attend the Congress due to an eye operation. In the new constitution (1999), the positions of President and Deputy President were eliminated and those of Chair and Deputy Chair were created. Maxwell Lee and Kevin Pickard respectively were elected to the new positions. The list of proposed Fellows . . . was read out, including the number of years of service for each. The names are: . . . Maxwell Lee (UK), . . . The minutes of the International Council meetings at this Congress were never completed. Maxwell attended the 2nd meeting having been re-elected. 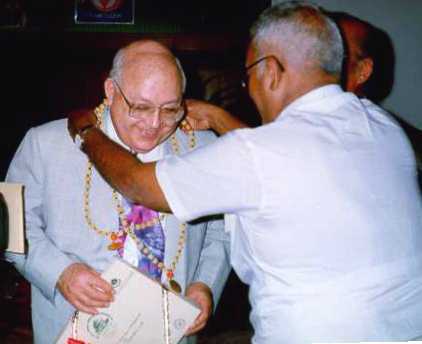 Maxwell was unable to attend the 36th Congress in Brazil, November 2004, and did not stand for re-election to the International Council, though he remained a Fellow of IVU. 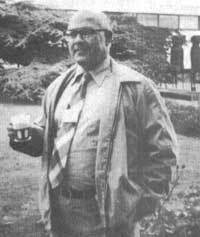 He died suddenly, early in 2005.